Livestock and Animal Specialties includes establishments such as dairies, farms, ranches, feedlots, broiler facilities, apiaries, egg production facilities, and poultry hatcheries, which are involved in grazing, keeping, and feeding of livestock for various purposes. It includes the livestock sales, livestock products, or for livestock increase. It is one of the critical sectors with full demand from multiple industries across the globe. If you wish to get into this field, Blue Mail Media is here to help you. We provide the best Agricultural Production-Livestock and Animal Specialties Email List that lets you reach all the top-notch decision makers and executives in this area. You can have seamless interaction with them regardless of boundary constraints. That is, you can contact the prospects residing in various regions such as the US, the UK, North America, Canada, Europe, Australia, Middle East, South Africa, and Asia. Blue Mail Media provides the best Agricultural Production-Livestock and Animal Specialties Email Database. It offers 85-90% of accuracy and more than 90% deliverability rate. This list is also designed to stay compliant with the GDPR and Anti-Spam law. Hence you can utilize the data in our directory to its fullest without any fear. We have a team of data analysts who gather the B2B contact records from authentic sources using high-end technologies. The sources include yellow pages, business directories, trade exhibitions, surveys, government records, conferences, and more. 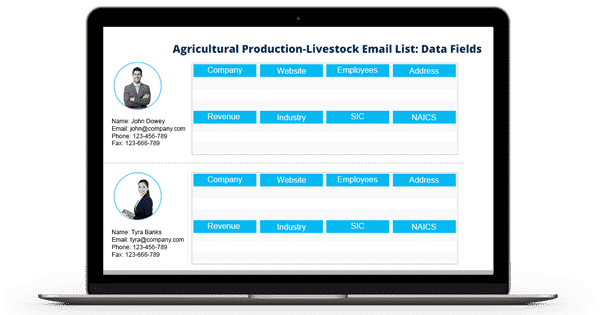 They are also responsible for keeping Agricultural Production-Livestock Industry Email list free from errors and redundancy. To perform the quality checks, they make thousands of verification calls and send several emails regularly. Get our Agricultural Production-Livestock and Animal Specialties Industry Executives List now if wish to maximize your revenue and conversion rate to a peak.